Exterior Talk about your rims, body kits, and other exterior mods here. Serious off-roading always require specific preparation. Off-road lights is a very functional upgrade for any truck, Jeep or SUV as they offer a much broader and brighter path of light in front of the truck, ensuring a safer driving experience. When you’re ready to add off-roading lights to your truck, it’s best to begin with a good set for the roof. Rigid Industries designed super bright lights, which can be used on SUVs and all terrain vehicles to extend the driver’s vision in dull weather and darkness. They are great for off-road adventurers who need bright light. Plus, this bar is offered in a wide range of lengths and configurations for you to choose from. Light up your road with these off-road lights! By the way guys, we have a good news for you! 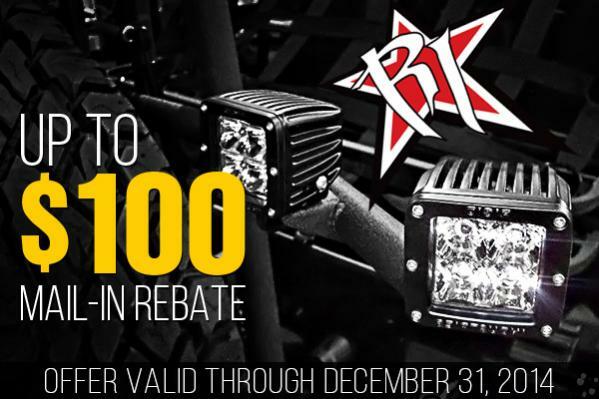 Do not miss the opportunity to get your cash back with Rigid Industries! Purchase $175+ of Rigid product value and receive a $25 manufactures rebate, buy $350+ of Rigid product value and receive a $50 manufactures rebate, buy $750+ of Rigid product value and receive a $75 manufactures rebate and purchase $999+ of Rigid product value and receive a $100 manufactures rebate. Act now, this offer expires on December 31, 2014. 4Runner side steps. Would you install them on your truck? All times are GMT -5. The time now is 05:50 PM.